The “Orange Wave” came crashing down Monday night as Justin Trudeau and the Liberal party secured a majority government with 184 seats—pushing the NDP to a third place finish. The mood was grim at the NDP headquarters in Montreal as the polls closed and results began to pour in. The shaking heads and long faces among supporters were interrupted by the occasional cheer for one of the party’s 44 victorious candidates. The NDP’s poor showing on election night was closely tied to its crippled standing in Quebec—a province whose support largely bolstered the party to the status of official opposition in 2011. Sandrine Traore, an NDP staffer, told The Link that the party succumbed to the divisive politics of the niqab debate, which she underlined as the main factor in their defeat. 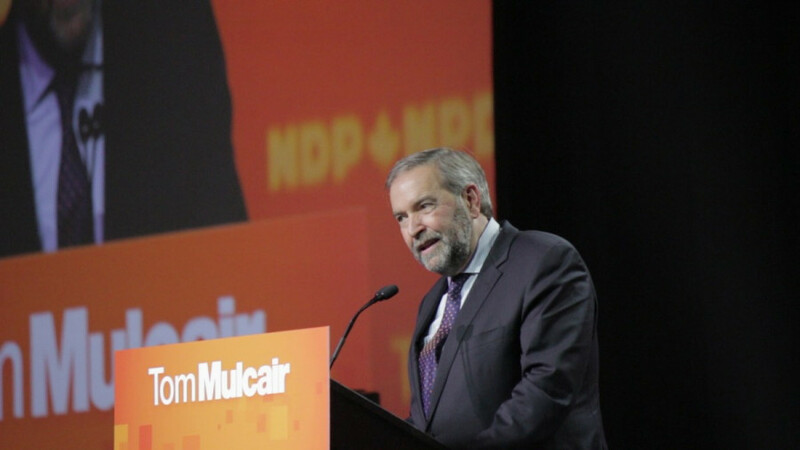 After making phone calls to the other party leaders, Tom Mulcair—who managed to keep his seat in the Outremont riding—took to the stage at the Palais des Congrès to deliver his concession speech. Despite the NDP’s significant losses, Mulcair remained smiling as he thanked his supporters and committed to working hard for them in the next majority parliament. Although the Conservatives came in second with 99 seats, the party announced that Prime Minister Stephen Harper would step down as leader. However, Harper held on to his seat in the riding of Calgary Heritage. Bloc Québécois leader Gilles Duceppe lost in his riding of Laurier–Sainte–Marie, leaving the party’s leadership situation uncertain. The Bloc made a few gains in Quebec, winning a total of 10 seats and finishing fourth nationally. Green party leader Elizabeth May won in her riding of Saanich–Gulf Islands in B.C., remaining the only Green MP in parliament.